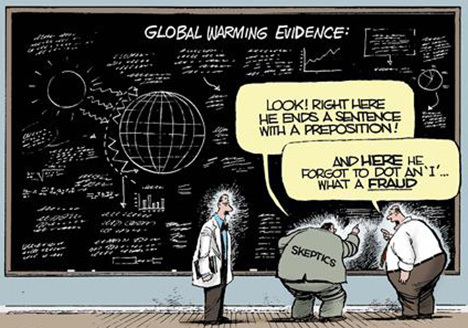 Sciblogs | Shy climate denier in ’science team’ reveals himself. Shy climate denier in ’science team’ reveals himself. More information related to local climate change denier attacks on NIWA scientists is starting to appear. The NZCSC (NZ Climate Science Coalition – a local denier group) has listed sworn affidavits supporting their arguments to the NZ High Court requesting NIWA abandon New Zealand’s temperature record. Effectively they are accusing our scientists of scientific fraud! A very serious accusation. Currently this case appears to be timetabled for the middle of the year. But my interest here is in the affidavit from Manfred Otto Dedekind. He has a B.Sc (Hons) in Physics (1986) and claims to be a computer modeller “constantly engaged with statistical analysis.” Why am I interested? Well, he admits that he was “a co-author of the 2009 NZCSC paper “Are we Feeling Warmer Yet?” Two years ago I was denied any information on the authorship of this paper, and its scientific input, by the NZSCC and its Climate Conversation Group (see New Zealand’s denier-gate and Climate change deniers live in glass buildings). In fact I was specifically told that the “science team “ who did the work for this paper wished to remain anonymous. It was the first time I had heard of scientists so shy about their work. But given Dedekind’s science background and admitted co-authorship of this “paper” (“Are we feeling Warmer Yet?”) I guess we have a case of a “shy scientist” (or perhaps he was their whole “science team”) reluctantly coming forward because of the impending court case. In the affidavit he describes himself as a “physicist” and “IT professional” living in Auckland who emigrated to New Zealand after working for 10 years “for the CSIR in Pretoria.” No indication of his current employment although he claims to “work as a computer modeller.” A search on Google Scholar produced just four engineering papers (two as senior author) published about 20 years ago. But they provided no statistical analysis to back up this claim! Now, at the time I thought that was scientifically inept. But Richard’s co-author Manfred describes himself, in his affidavit, as having “a sound grounding in the practical application of statistical technique.” So he should have known he could easily test his and Richard’s claim that adjustments for station site changes were unnecessary with the appropriate statistical analysis. Well, at last Manfred has put his hand up. I am pleased to see that he and his mates have included their “paper” “Are we feeling Warmer Yet?” on their index of exhibits for the High Court. Maybe NIWA will get the opportunity to put to him the questions I have raised. No judge will put up with the avoidance tactics dished out to me. I guess we are all interested in seeing how the High Court reacts how the court reacts to Manfred’s request that NIWA’s temperature record “be rejected.” Actually, I am also interested in hearing what the judge has to say about the malicious nature of their request and the time wasted by the court.